Need to shred and get rid of some paperwork…get FREE 2lbs Shredding at Staples! Expires June 10, 2017. 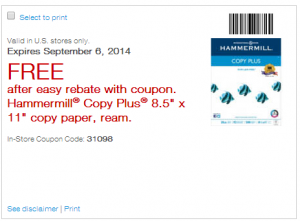 Staples: Ream Of Hammermill Copy Paper Only $0.01…AWESOME!!! If you’re in need of paper…or just want to pick up a FREE (well…almost free) ream, grab this printable coupon below and race over the Stamples this week – check it out. Staples: Get a Ream of Multi-Purpose Paper For Only $0.01 After Rebate! Score a ream of multipurpose paper for only a penny this week at Staples! Go here to print your coupon, submit for the Easy Rebate, and pay $0.01! Staples is at it AGAIN! They’re offering a ream of multipurpose paper for just a PENNY after easy rebate, a long with a bunch of other GREAT coupons this week! Most of these coupons expire on July 18 so don’t forget to use them! Staples: $0.01 for printer paper!!! Along with a host of great “back to school” deals going on at Staples right now, looks like they’re almost giving away paper again – AWESOME!!! Use this printable coupon to buy a 500 sheet pack of paper for only $0.01 (after rebate). Staples: (Almost) FREE paper – AWESOME!!! Time to score some (almost) FREE paper again…AWESOME!! FREE Case of Spring Water at Staples Stores!!! 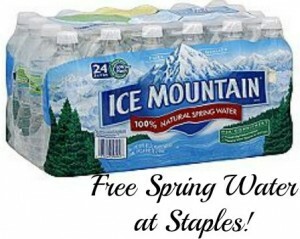 Head to your local Staples store with this coupon for a FREE Case of Spring Water! Valid 10/18/14–10/19/14 in Staples® U.S. stores only. Discount applies to regional spring water, cases only, item nos. 322918, 383829, 395312, 396724, 396936, 396727 and 452168. Not valid in NYC metro markets. While supplies last. Limit One Per Customer. 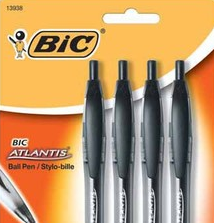 Through September 20th, Staples has BIC Atlantis Ballpoint Pens 4-Pack on sale for just $1.00 per pack (regularly $4.49)! Use the $1.00/1 BIC coupon to score FREE Pens! Be sure to visit Staples and grab a new hot freebie just in time for the new school year!